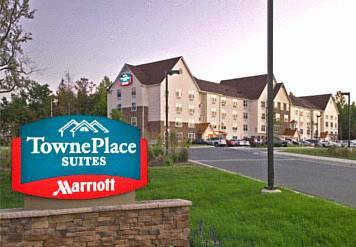 At the TownePlace Suites by Marriott Bowie Town Center, we have perfected the extended-stay experience for business travelers, project teams, and relocating families by combining all the comforts of home with our Marriott World Class Service. Just a short distance from the hotel, you'll find the Bowie Town Center (an outdoor shopping mall) and The Shops at Bowie Town Center, Bowie State University, Bowie Baysox Stadium, The Prince Georges Equestrian Center, Six Flags America, IRS and Computer Science Corporation. Our 119 room hotel provides amenities that really matter - spacious rooms, fully-equipped kitchens, large work areas with free high-speed internet access. There is an on-site guest laundry, exercise room and an outdoor pool, plus 24 hour staffing and housekeeping services based on lenght of stay.